The Joshua vs Povetkin undercard live stream is being partly made available shortly and you can catch it right here on Boxing News and Views below. Today is all about the main event for many of course but no pay per view event in the UK or big fight in the US involving Joshua would be complete without an undercard. This weekend’s boxing is no different. David Price and Luke Campbell being the two notable names later on in the undercard in tonight’s boxing but there will also be a host of talented up and comers starting soon below. Joshua as things stand is probably just about on his way to Wembley now after a full pre-fight meal to fuel himself for the challenge awaits in Povetkin. 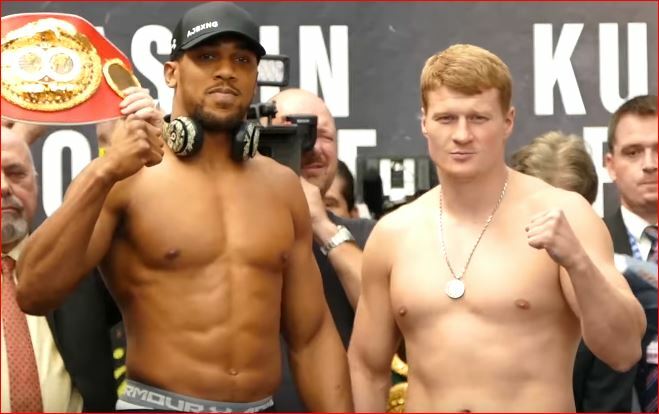 Povetkin came in quite light at yesterday’s weigh-ins which many believe is a sign he’ll look to try to get off to a fast start and potentially catch Joshua cold. Povetkin can crack with either hand and with Joshua having been down before in his career, there is no denying that Povetkin has the power to drop him and hurt him if he gets the chance. That’s if he gets the chance though. Joshua is arguably one of the hardest punching men on the face of the Earth. He’ll try to take Povetkin out, no doubt, but that will not be an easy thing to do.